OKLAHOMA CITY (Dec. 7, 2016) – Responding to new federal and state laws that set requirements for school accountability, the Oklahoma State Department of Education (OSDE) is proposing adoption of a new, stronger and more reliable A-F School Report Card system. The agency’s recommended calculation will be voted on by the State Board of Education at its Dec. 15 meeting before being submitted to the state Legislature and governor for final approval. The report card calculation is the result of months of collaboration between OSDE staff and a 95-member task force representing educators, parents, students, higher education, Career Tech, business and community leaders, tribal nations, lawmakers and organizations advocating for students with disabilities and English learners (ELs). State Superintendent of Public Instruction Joy Hofmeister said the proposal fulfills mandates established by the federal Every Student Succeeds Act (ESSA), which replaced No Child Left Behind, and by House Bill 3218, which Gov. Fallin signed into state law earlier this year. A group of assessment and accountability experts worked with the task force to draft the final report of recommendations. The team leader was Marianne Perie, Ph.D., of the University of Kansas’ Achievement & Assessment Institute. Notes and full audio of task force meetings are posted on the OSDE website at sde.ok.gov. The new calculation gives equal weight to student performance in English language arts (ELA) and mathematics as well as student growth in these subjects. Other indicators include English language proficiency assessment (ELPA) progress, graduation rate, postsecondary opportunities and chronic absenteeism, which is defined as missing at least 10 percent of the school year. 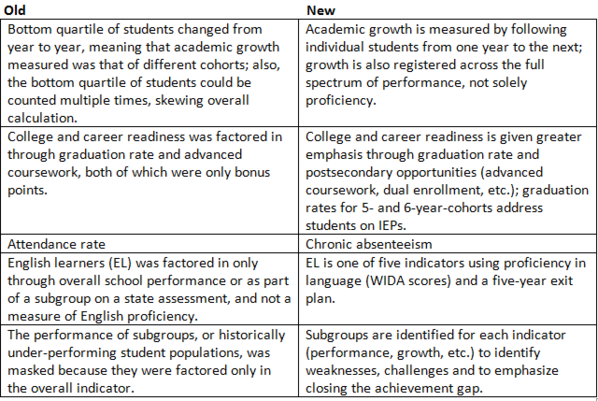 The revised report card system is a significant improvement over the state’s prior incarnation. Copious research has highlighted the link between chronic absenteeism and low academic achievement. More than 16 percent of Oklahoma high school students were absent at least 15 school days in the 2013-2014 school year. That figure was 9.5 percent for elementary school students and nearly 12 percent for middle school students. ELA performance – 15 pts. Math performance – 15 pts. Science performance – 5 pts. ELA growth – 15 pts. Math growth – 15 pts. English language proficiency assessment (ELPA) progress – 15 pts. Chronic absenteeism – 10 pts. While high school grading is similar to that of elementary and middle schools, greater emphasis is placed on college and career readiness. Measuring growth is problematic in the short term given that OSDE is recommending an off-the-shelf college-readiness exam for 11th grade, but the OSDE’s final report details how a growth indicator could be added within several years. Science performance – 15 pts. ELPA progress – 15 pts. Graduation rate – 10 pts. Postsecondary opportunity – 10 pts. In addition, a high school can receive an additional point for high participation and proficiency in U.S. History. Task force members praised the collaborative spirit that informed the accountability process. Under the new report cards, the grade scale is designed to reserve A and F designations for the best and worst schools. Subsequently, the bulk of schools will fall into the B, C and D ranges. This change ensures that resources are focused on the lowest-performing 5 percent of schools, designated as comprehensive support schools. Schools with the lowest achievement for one or more student groups, but not in the lowest 5 percent, will be identified for targeted support. Federal law requires schools to test at least 95 percent of their student population. Under the new report card system, a school that fails to do so with any student group will receive a “minus” beside its letter grade. The report cards will also contain other information as required by ESSA, such as per-pupil expenditures, that will not factor into the calculation. The report cards will enable people to dive deeper into data.